Our caramel wrappers or twist wraps are specially designed to be easy to unwrap, resist tearing and sticking, and provide a humidity barrier. Waxed paper could be cut and used effectively for some caramels. In general the paper sold for home use is too light weight, the grain of the paper isn't made to withstand twisting (it tears), and the wax coating is too light to prevent the moisture from the candy from seaping into the paper and weakening it thus causing it to tear and stick. 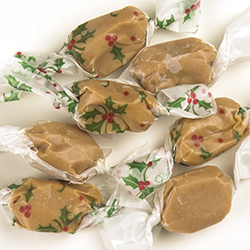 If you use caramel wrappers for taffy or hard candy the wax coating acts as a barrier to moisture and humidity helping to keep your candies from getting sticky. You can cut the wrappers in half to wrap more candy with a smaller package if you are careful when twisting. The paper used for the caramel wrappers is designed to resist tearing when twisted across the long side. 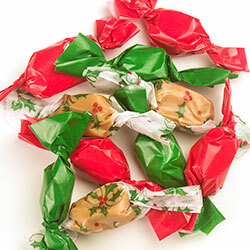 Get more mileage out of patterned and colored wrappers by combining them with white caramel wrappers. Never toss a recipe of caramel without looking to us for help. See "Contact" link at top of page. We will be adding an FAQ/troubleshooting page on different ways to recover caramels that are over/under cooked, separated, need a new flavor, etc.